Patti LuPone’s deft purloining of a texting front row audience member’s cell phone – an action deservedly praised far and wide -- is likely to be how posterity will best remember Douglas Carter Beane’s paean to community theater. For, truth to tell, the play is not otherwise one for the ages, though there are pleasurable elements, chief among them, Ms. LuPone herself. 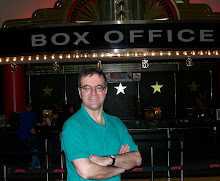 This is an autobiographically inspired story of a young man’s introduction to the theater; specifically, a regional playhouse in Reading, Pennsylvania in 1973. Of course, we’ve seen this sort of story before, done rather more persuasively. Last season’s adaptation of Moss Hart’s “Act One,” also from Lincoln Center Theater, is such a one. “A Life in the Theater,” is another. 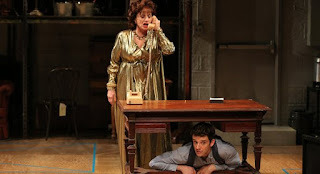 Beane’s semi-autobiographical plot involves a young man named Car (the engaging Michael Urie, though some of his opening remarks struck me as more cloying than endearing). We first see him as an adult, before the play flashes back to his recollections of being a 14-year-old teenager stumbling into the theater run by the indomitable Irene (LuPone in entertainingly dynamic form). In short order, he’s swept up in the excitement and glamor of Irene and her strange eccentric company, including Sid (Dale Soules), the butch stage manager of the Prometheus Theater, Damien (Jordan Dean), the sexually ambivalent actor having an adulterous affair with the married Irene, Clive (Lance Coadie Williams), the grandiose leading man, and Maria (Zoe Winters), the ingénue. Car develops a crush on Damien whose perpetual teasing seems to carry sexual undercurrents. When Car writes some amusing bios of the company for the theater’s program, he’s drafted to be the resident playwright. Their theater is eventually targeted for the wrecking ball, and only a blackmailing threat from Irene averts demolition. A rival company becomes another challenge. Much of this progresses amusingly (with Beane is characteristic comic form), though eventually matters turn rather serious, a tonal shift that hurts the play. Though there are some sharp jibes about the ethos of community theater, the story and most of the characters are not ultimately very convincing, and the plot’s occasionally confusing, too. Beane can write some funny lines, but you often sense them coming a mile away, and often you have the feeling you’ve heard them before. But legendary director Jerry Zaks knows how to keep things moving. LuPone is marvelous as this larger than life character. She’s such a celebrated musical theater performer, even though she’s appeared in scores of plays, it’s always good to be reminded again what a terrific straight actress she is. Though this is one of those over-the-top roles, hers is a highly disciplined, well-crafted performance. The rest of the ensemble is capable, with Soules and Urie the standouts. John Lee Beatty’s sets, Long’s costumes, Natasha Katz’s lighting, and Leon Rothenberg’s sound design are all top of the line, as you’d expect..
Patti LuPone and Michael Urie. Photo by Joan Marcus.